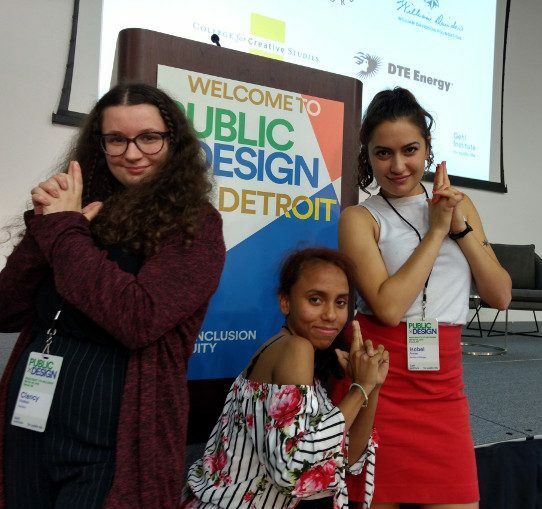 In September youth leaders from Territory presented at Public X Design, an international conference on inclusion and equity in urban design and planning hosted by the Gehl Institute. How do teenagers experience the urban environment differently than everyone else? How do teenagers today experience the city differently from generations of young people before them? And how can urban designers collaborate more effectively with teens to improve existing places? Isobel, the facilitator, and youth leaders Clancy and Mia launched the presentation with a short introduction to Territory’s work. The three leaders swiftly turned to the audience and asked everyone to share a memory with the person next to them about a favorite public place they went to as a teen. After a moment for reflection, Isobel played three audio recordings by our summer team members telling their own stories about public spaces in Chicago. Mia and Clancy used each story as a prompt, asking the audience to reflect on exuberance, trust, consequences and loyalty. Through this process of listening and sharing, the audience experienced the layered and conflicting realities of being a teen in public space. Although they are some of the most frequent users of public space, it can be a struggle to get youth engaged in the design process. In fact, teenagers are often made to feel unwelcome in urban public spaces through policies that aim to control loitering and vandalism. Even spaces designed specifically for teenagers, such as skate parks and arcades, have their own limitations and isolating effects. As the future leaders of their communities and the world, young people have the right to safe, welcoming public spaces. Last summer Territory instructors Kat and Isobel each facilitated a design team. The teams created their own version of Walk In Our Shoes, Territory’s youth empowerment walking tour. The tour is a walking performance led by teens where adults experience the city as a young person. The stories we presented at Public X Design presentation came from these tours. Visit Territory’s online audio journal to hear more. Territory Chicago is young people building voice, vision and agency through the practice of design in our communities. Rather than advocating for “a seat at the table”, Territory youth develop their own vision and invite partners to sit at the kid’s table- inverting the process of inclusion in the process. 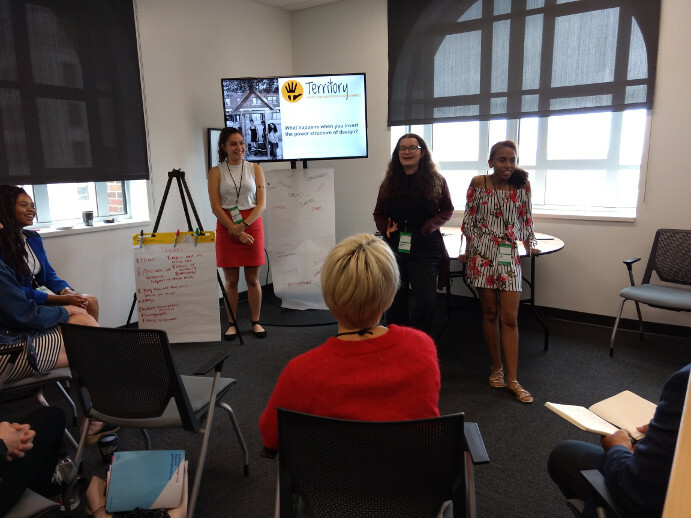 By independently designing and creating maps, walking tours, wayfinding devices, and more, Territory teens are proving that radically inclusionary praxes don’t need to start with a professional designer in the room. The closing slide in the presentation asked: “What happens when you invert the power structure of design?” At Public X Design, audience members moved in closer, curious to learn more about Territory’s work from our team. Don’t be afraid to jump the hurdle between you and your teenage years. Get on Territory’s mailing list, and we’ll give you a chance to grab a seat at the kids table. It is electrifying.